One of the true joys of travel is sampling food for the first time and instantly falling in love. Unlike other exotic foods which are more of an acquired taste, dim sum was love at first bite. I can still remember trying it for the first time one morning in Malacca, Malaysia at a popular little Chinese tea house. Elderly Chinese ladies wearing aprons pushed around carts filled to the brim with steaming trays releasing a mixed aroma of shrimp, pork, custard and red bean paste. Men and women engaged in animated conversations at large tables while others sat alone sipping on tea while reading a newspaper. Not knowing what to order (and without the aid of an English menu) I used hand gestures and pointing to select items that were placed on my table in delicate little trays. 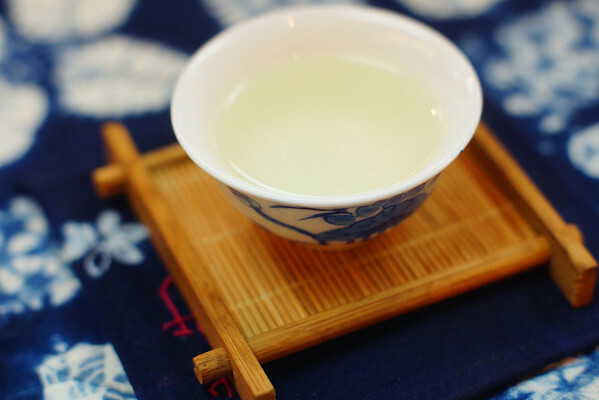 Soon a pot of hot tea was placed on my table. With a tiny tea cup, chopsticks, a small serving bowl and sauce dish I randomly plucked at an ever growing spread of small bite sized food covering my table. 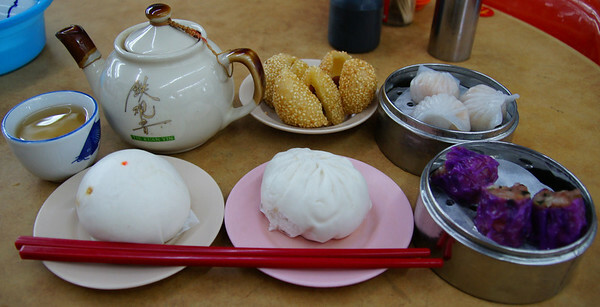 Dim Sum is bite sized portions of Cantonese food served on tiny plates or in steamer baskets. 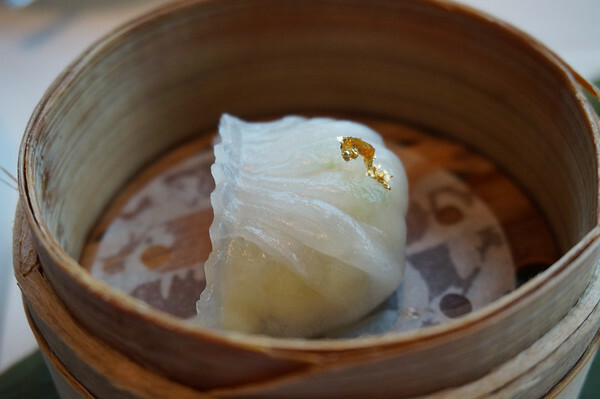 Traditionally, dim sum is wielded around in carts – pushed from table to table – where customers can select their order from the comfort of their own table; however, these days in Hong Kong, space is at a premium and unless you’re dining at a banquet hall style restaurant, you’re most likely to place your order on an slip of paper where you select your food items on a checklist. 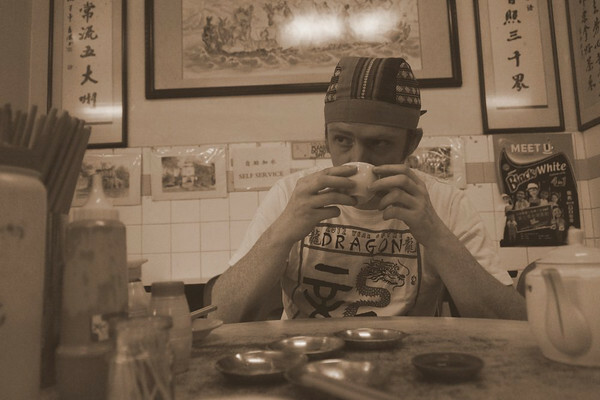 To invite someone out for dim sum (点心 / 點心) is roughly translated in Cantonese as going out to ‘drink tea’ at a restaurant. It’s similar to etiquette in Korea, whereby you’d ask someone out for dinner by inviting them to join you for rice. Dim sum literally translates as ‘touch the heart’ was originally intended to only be a snack; however, it is now a staple of Cantonese dining culture and restaurants can be found all over Hong Kong. These delectable transparent dumplings are stuffed with prawns and were instantly one of my favorites. Apparently, dim sum masters are judged based on the skill of preparing this particular dish. It’s such a delicate dish where the skin must be thin and transulucent yet sturdy enough not to spill open its contents when picked up by chopsticks. This is one of the more expensive dim sum dishes often costing 1.5 times to double the price of others. If somehow I was forced to only ever one kind of dim sum to eat for the rest of my life (oh, what a tragedy!) I would select baked barbecue pork buns. The baked variety (they’re also served steamed) features a crispy exterior that is browned and glazed with light sugar producing a delectable golden crust. The interior is filled with saturated slices of slow roasted pork tenderloin combined with a syrupy concoction of hoisin, soy and oyster sauce, sesame oil and sugar. 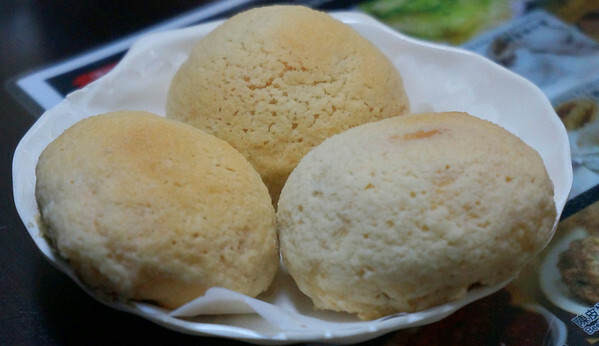 When I sink my teeth into these baked pork buns I just let it roll around and melt in my mouth. For those unfamiliar with dim sum, having a large lotus leaf wrap brought to your table could potentially raise eyebrows. However, for those brave enough to peal away at the leaf wrapper will be rewarded with a sticky rice, chicken, Chinese mushrooms and sauce. Considered a southern Chinese specialty, glutinous rice forms a base that is filled with chicken, Chinese mushrooms, sausage and scallions. If you’ve ever tried eating Thai Mango Sticky Rice it is similar in terms of the way the rice is prepared. Those with a sweet tooth will be rewarded at the dim sum table. Be sure to try sweet sesame balls, a Chinese pastry, made with a lotus paste filling and crispy outer exterior consisting of glutinous rice flour coated with sesame seeds. Dim sum is a social meal. Friends from Hong Kong have mentioned the optimal group dynamic is 3-4 people considering dishes typically are served in portions consisting of 3-4 small serving sizes. If you’re alone don’t let that prevent you from frequenting a dim sum restaurant. In the past, I’ve gone solo and feasted on many trays of dim sum alone. If you want to eat more like a local don’t fill up a sauce tray with soy sauce. Dim sum ‘done well’ doesn’t require sauce. You won’t notice locals eating at their favorite spot dipping their dim sum in any sauce. Where to eat Dim Sum in Hong Kong? Tim Ho Wan has the impressive distinction of being the cheapest Michelin Starred restaurant in Hong Kong. High quality dim sum at affordable prices is what brings in people by the droves. We ended up dining here for the first time with a group of fellow expats based in Hong Kong. We’ve ended up coming back many times considering it is located within walking distance from our hotel in Mong Kok. Have you tried dim sum before? What are some of your favorite dishes? Any favorite spots to eat dim sum? If you’ve never tried it before is it something that looks appealing to you? Your Dim Sum videos are my favorites from your YouTube channel. I would not feel like eating at the crack of dawn though! Great post! 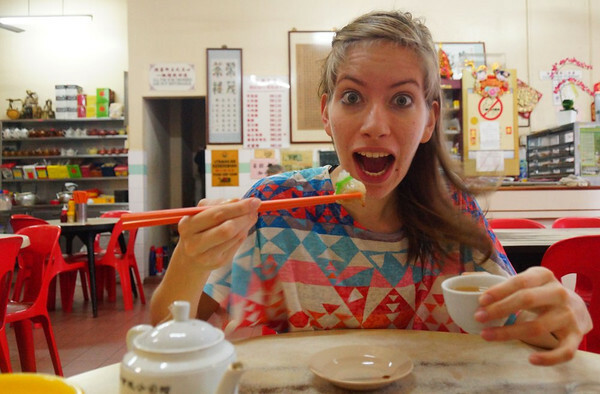 We luv dim sum – and have enjoyed lots of it on our trips to Hong Kong! We’re also very fortunate that here in Vancouver (Canada), we have hundreds of great Asian restaurants to satisfy our dim sum cravings whenever we want :-). Thank you! Indeed, Vancouver is a wonderful place to sample Asian cuisine. I’m from Vancouver Island, so I would always get excited to visit Van when I was young. I feel you Lillie even though I can’t be pregnant. Made me drool while reading through the entry. Gonna get some Chinese dinner tonight! Best wishes with your quest for Chinese food James! I’ve become more fond of rice since basing myself in Asia. They are basically bite sized morsels of heaven. Great post! Now I’m starving. What an awesome cuisine! Dim-sum sounds interesting! I have been to Malaysia once for a few hours, didn’t get a chance to explore its food. But after reading this, I think I need to go back! If they would not be sticky, they remind me of the Idli of south India made of Legumes and rice flour, in different varieties, eaten with different chutneys, my favourite being a coconut chutney! They do need a chutney or a sauce to go along, as they hardly have any flavour. I would love to try the Idli! Vancouver does have a great food scene! I miss the diversity and quality. Yum! Fabulous post and wonderfully educational videos! Thank you! I have to admit to not really knowing the definition of dim sum 20 minutes ago and to being quite certain that I will now have it for dinner tonight – even if I am far from Asia! Yummy post! I will have to check out your recommendations. Dim Sum Is Yum Yum. One of my favorites is the steam dumplings. I always get these when I visit China and stuff my face till I’m sick of it. Those are really good as well! I’m such a pig whenever I go to eat dim sum. No small wonder my pants all feel tight. Great post – I actually tried Dim Sum for the first time this past weekend in my home city at a fantastic place called Baby Buddha Chinese Teahouse! The pork buns were amazing! I love Dim Sum so much, although I’ve not been down to Hong Kong yet (I do need to visit) I had some wonderful Dim Sum in Shanghai from street vendors and shops alike. There is so much variety in Dim Sum its great! That’s great Alex. I didn’t realize Shanghai had such a thriving dim sum scene. Thanks! I’ve also noticed the push carts disappearing fast as well. It’s too bad! Thanks Cheryl 🙂 It’s definitely a social meal. It’s rare to see someone alone eating dim sum. 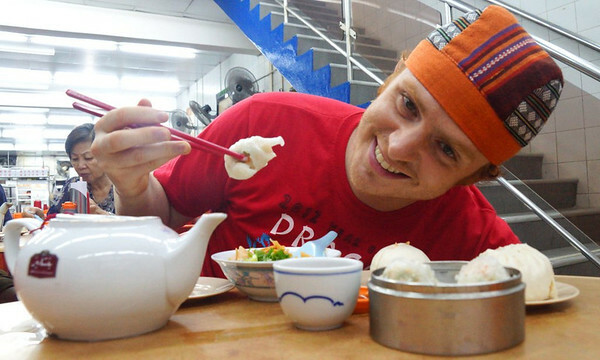 I’m intrigued by all of the suggestions – in the comments – for places to try dim sum abroad. We lovvve dim sum ~ it has always been a favorite. We blogged about eating it in Chinatown, San Francisco a year ago. The most fun place that we ate dim sum was Lima, Peru on Christmas day when everything else was closed ~ you can always count on dim sum to delight. Many cities in the world have Chinatowns, worth seeking out. Luckily for us, we are living in SE Asia now, so dim sum like food is all around. Dim Sum is the absolute greatest thing in the universe for people who have no idea what’s going on and just want to point to things and eat them and they’ll be amazing. I wish other cultures would steal this idea and serve food like this all over the world. I mean, we stole gunpowder and fireworks from them, so why not snag their food serving culture too? Great idea! I’ve often felt limited by western/european menus featuring only mains and appetizers. I want it all! I’ve tried the Tibetan momos before while traveling in Mcleod Ganj. They are good – especially on a cool/cold day. Surprisingly I think this is one of those foodie/travel thingies that I haven’t done, at least done right. I don’t know why. With your handy dandy guide, I think I’m going to have to dive in again. Going to Malaysia in December…I’ll try and find a good Dim Sum restaurant. Malacca and Georgetown are both great options to try it – especially early in the morning. Not heard of dim dim before but seems like a dish I might want to try, certainly an exotic food. I don’t mind trying the sesame balls. I hope you get a chance to try in Shalu. 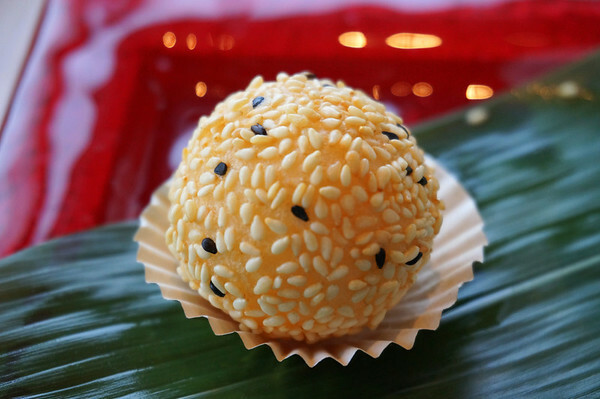 If you have a sweet tooth the sesame balls would be a great first choice. I love dim sum! My friend’s father is a native Hong Konger and took me to one of the old school places where the ladies still serve the dishes from push carts. Shrimp dumplings and pork puns are two of my favorites, along with deep fried yams stuffed with roast pork. Delish! Hahahaha, I’ve done that so many times as well. Where I live, Dim Sum is a Sunday brunch favorite… meet your friends and spend a couple of hours catching up – the pace of service and the small bites are perfect for such a gathering. 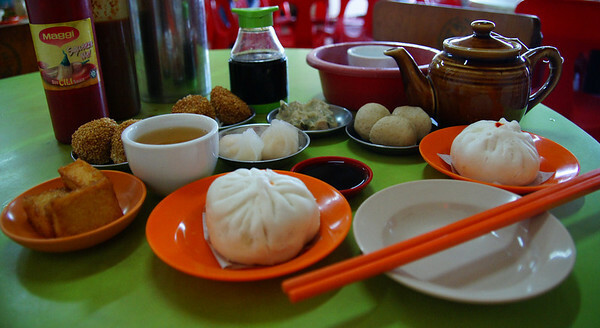 Is there any difference between Dim Sum and Min Pao ? I’m not sure to be honest! I’m a dim sum fan also, but I have to fly to Honolulu or San Francisco to even get my hands on some of these puppies, if you love har gaw, then you would probably also love the deep fried shrimp balls with sweet mayonnaise or even Sui Mai with pork and shrimp…missing it already! I wish it was easier to eat dim sum abroad. Sam & Audrey, thanks for reminding me how good it was in Hong Kong! My sister and brother in law took me to their favourite places in Central, Wan Chai, Causeway Bay, Happy Valley (HKJC, actually), and Tai Koo. I can imagine you’ve been to some of the best spots in all of Hong Kong! Nice post Sam, now I’m really craving some dim sum. One of my all-time favorites is lo mai gai, and also the fried taro puffs stuffed with minced pork! I love the taro puffs with minced pork as well! Outstanding resource … had some dim sum in Penang, and they bite-sized versions of heaven! Handy resource, especially if you are not with a local! I LOVE Dim Sum and especially those moments when you drop something from your chopsticks and you quickly place said food between them like it never happened 😉 I can’t do a lot of Dim Sum in one bite.